Before sacrificing herself on the altar of duty in an important arranged marriage, Lady Ann decides to experience one last day of unchaperoned fun. Her attempted escape, however, appears to be foiled when she gets stuck in a tree. She is fortunate to be rescued by a gallant gentleman, who then accompanies her on a most excellent adventure. When she finds herself falling in love with her handsome rescuer, will she be able to give him up for the sake of duty? Note: This is a short story of approximately 12,000 words. 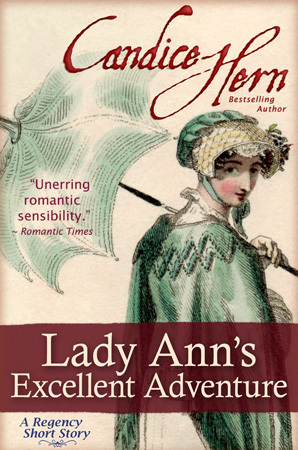 AustenProse awards Lady Ann's Excellent Adventure 5 stars: "A delightfully breezy and upbeat glimpse at two aristocrats playing hooky from duty and decorum, “Lady Ann’s Excellent Adventure” is all that its title promised. It is Roman Holiday meets Georgette Heyer and I could not be more enchanted with this reverse fairytale of two strangers who climb down from the their high perch and enjoy the simple life and each other without inhibitions or preconceived assumptions. I was so captivated by each of the protagonists that I did not want their story to end. Like the conclusion of the delightful movie Roman Holiday, they do have to face the reality of their return to royalty, but their lives will never be burdened with regret." The Earl of Evesham grinned like a child with a new toy as he drove the elegant curricle down Park Lane. He’d just picked it up from the carriage maker and was more than pleased with its balance, buoyant spring, and smooth ride, not to mention the gleaming yellow-gold side panels and the tufted black leather seat. The earl was not, in general, a man overly concerned with what was fashionable, but he felt singularly pleased to have so up-to-date a sporting vehicle. He understood now why the smaller two-wheeled curricle was starting to overtake the perch phaeton in popularity. It was light, nimble, and sleek as a jungle cat. The earl sprung the team down Park Lane as the traffic was light this early in the day, but slowed as he passed the Riding House at the edge of Hyde Park, and turned left onto Mount Street. It was a narrower street lined with rows of elegant houses, so he intended to take a more sedate pace. But an interesting sight caused him to rein in the horses. A young woman sat perched in a tree on the other side of a large fenced garden. She appeared to be attempting to make her way over the fence, but her skirts had become caught in a branch. As she twisted and tugged in an effort to free them, she provided the earl with an excellent view of very trim ankles, set off to advantage with the criss-crossed blue ribbons of her slippers, and a bit of shapely leg. What an intriguing situation this was, considering the owner of the garden was the man he was appointed to meet the next morning in order to make a formal offer for his daughter. It was a marriage arranged in his boyhood, and he hadn’t set eyes on his future bride since she was a small girl. For a brief instant, he wondered if this pretty hoyden could be she? But it was highly unlikely that Lady Ann of Gloucester, daughter of Prince William Henry, Duke of Gloucester, and niece to the king, would be perched inelegantly up a tree. He certainly hoped not, anyway, as he was committed to the marriage with her and had no wish to marry a girl who behaved with such impropriety. Lady Ann had only just returned from Vienna, where she had been living with her cousin Charlotte, Duchess of Württemberg. But as Charlotte’s husband had recently begun to align himself with Bonaparte, both the king and his brother Gloucester thought it best to send for Lady Ann and remove her from imprudent political influences. 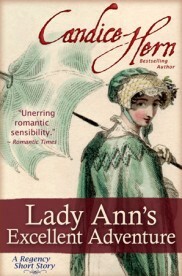 They wished her to be safely married to a loyal Englishman with ties to the royal family, and so the long-ago arrangement between Gloucester and the Duke of Lancashire, the earl’s father, was now to take place. A young woman of royal blood, educated in Europe, steeped in protocol by high-stickler cousins at the courts of Denmark and Württemberg would never dream of getting herself up a tree. It must be some other female of the household. Perhaps even a servant, sneaking out to meet her young man. The earl could not contain his curiosity, and drove the curricle to a stop beside the overhanging branches of the tree. A note of fear colored her voice. Had his arrow accidentally hit its mark? Was she a thief? Or was she in fact a family member – or perhaps a high-ranking servant – worried that she might be found out and reported? “Hmm. I think if I am to be an accomplice I will need to know what I am getting myself into.” He signaled for Parker to see to the horses, leapt down from the seat, and then leaned nonchalantly against the curricle as if it were the most ordinary thing in the world to be having a conversation with a pretty girl stuck up a tree. He’d discarded the notion that she was a housemaid sneaking out for an assignation. Her clothes were very fine – a white muslin gown with a blue velvet spencer jacket and matching hat – but maids were often given last year’s fashions by their mistresses, so the quality of her dress was no accurate clue to her identity. But her exposed stocking was clocked in fine gold embroidery, much too exquisite for any maid. She must be a member of the family. But not Lady Ann. Not a girl raised in the highest royal circles. She did, though, have the same honey blond hair and blue eyes he remembered from the last time he’d seen Ann as a child, but any family member could have that same coloring. He could not, however, imagine why a young woman of high rank had climbed a tree in order to get over the garden fence. Gloucester would never countenance such behavior in his household. So who was she, this adorable sprite? Surely, not Lady Ann. Considering what he knew was to happen tomorrow, this did not bode well. Dear God, it was Lady Ann. Had to be. And she saw him as an unwelcome duty? He supposed he could hardly blame her for thinking so, as he had harbored similar thoughts of her. He had not been looking forward to the Grand Marriage to a prim, tight-laced young woman trained to be the perfect aristocratic consort. In fact, he was prepared to accept her as the typical royal cold fish, but he’d never been thrilled about it. In his relationships with women, he’d always preferred a more lively girl, but never dreamed of marrying one. He had been destined for a marriage of duty. And yet, this was not the reserved, formal, very proper young woman he’d expected. He was not sure what to think about that, but he suspected it could be a troublesome match. So simple a declaration. And he believed she meant it. But could a tree-climbing girl who liked to run away ever be truly dutiful? He could not imagine what sort of wife she’d make.